Dinners by the sea. Lunches by the harbor. Drinks on the historic verandah. Relaxing days and unforgettable nights await at Henry's and the Lighthouse Grill on Martha’s Vineyard. 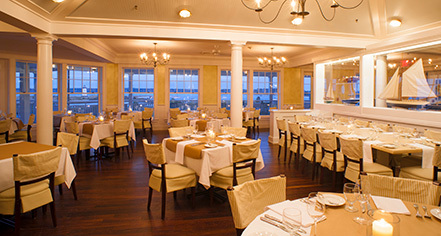 Known for its historic Edgartown setting, relaxed coastal style, and the island’s best view, Lighthouse Grill is a favorite of Harbor View Hotel guests and Vineyard locals. Award-winning executive chef Richard Doucette showcases the freshest local ingredients from island farms and fishing boats in a sophisticated menu that focuses on line-caught seafood, sourced daily from New England waters. The extensive raw bar is a special highlight. Stylish and welcoming, Lighthouse Grill’s expansive, airy dining space is wrapped by floor-to-ceiling windows that afford a breathtaking view of Edgartown Harbor and the lighthouse that inspired its name. The friendly, knowledgeable, and approachable staff assists diners in choosing the perfect wine from an extensive selection and can recommend favorite dishes to create a truly memorable dining experience. 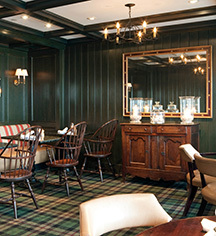 The Vineyard’s best-kept secret, Henry’s is a cozy hideaway tucked into the historic main building of Harbor View Hotel. In the evening, in-the-know locals and hotel guests mingle over appetizers and small plates, ideal for sharing, as they soak up the friendly atmosphere and sweeping views of Chappaquiddick, the entrance to Edgartown Harbor, and the iconic Edgartown Lighthouse. The team of talented mixologists expertly crafts traditional and creative cocktails and can recommend the perfect wine from an extensive list. In the daytime, Henry’s serves a hearty breakfast, complete with illy-brand coffee and coffee drinks, and a full lunch menu with an emphasis on local sourcing. Gather indoors to view the big game or relax on the shaded terrace and watch the people and boats go by. Lunch is served from 11:00 a.m. - 5:00 p.m. An evening small plates menu is served from 5:00 p.m. - 9:00 p.m., Sunday through Thursday, and until 10:00 p.m. on Friday and Saturday.